Opening session - Short presentations of SMEINNOBOOST PPs have been presented to have an idea who is involved in the project. 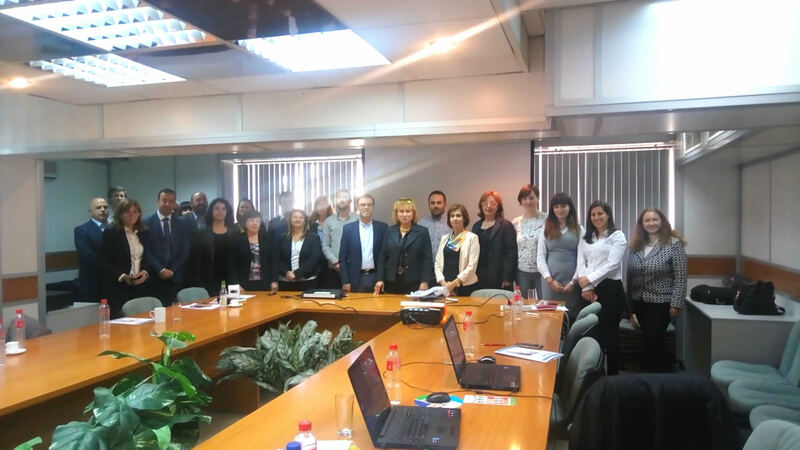 During the general presentation of SMEINNOBOOST Project by the Project Manager emphasized the main requirements of the Balkan Mediterranean Program /BMP/ towards the project activities and deliverables. At the end of this session it was established the Steering Committee of the project as per the Partnership Agreement. Project management session was focused on reporting and reimbursement of the invested funds incl. Project Implementation Manual Rules – Project Manager (Project progress); Project Implementation Manual Rules – Financial Manager; Project Implementation Manual Rules – Communication Manager and Q&A. Afternoon session - WP 3 - Statistical information for benchmarking at transnational and SME level - Presented by PP2, during the discussion all PPs contributed to discussion but more actively LP, PP2. PP3, PP4, PP5 and PP8. The main focus here was on the timeline of activities in WP3, logic dependence of every next step, content of the survey (questions and methodology) as a basis of Self-Assessment Tool. Special attention was paid on importance LP to prepare the assignment for the Needs Analysis in coordination with PP2, PP3, PP4, PP7 and PP8. The same approach was agreed to follow for the assignment for the statistical survey. It is expected it to be finalized at the end of 2018. Afternoon session - WP 4: Self-assessment tool (SAT) –Presented by PP8, during the discussion all PPs contributed, but more actively LP, PP2, PP5. PP6, PP7 and PP6. As SAT is core project result during this session WP4 activities have been discussed in details trying to achieve common understanding of SAT, its e-srtucture, relation to statistical survey and other data which should be used, characteristics of its functionality and other. It was agreed that its development can start in parallel with the analysis of statistical survey data in order to use the time and to have time for alfa and beta versions. Afternoon session - WP 5: Transnational Innovation Clusters - Presented by PP7, during the discussion all PPs contributed, but more actively PP7 and PP8. During the discussion it became clear that very important moment for the final success of WP5 activities is coordinated communication between PPs. Afternoon session - WP 6: Enabling factors for the successful innovator - Presented by PP6, during the discussion all PPs contributed, but more but more actively PP6, LP and PP8. In details has been presented the idea for SMEINNOBOOST web site and its menu and functionalities.